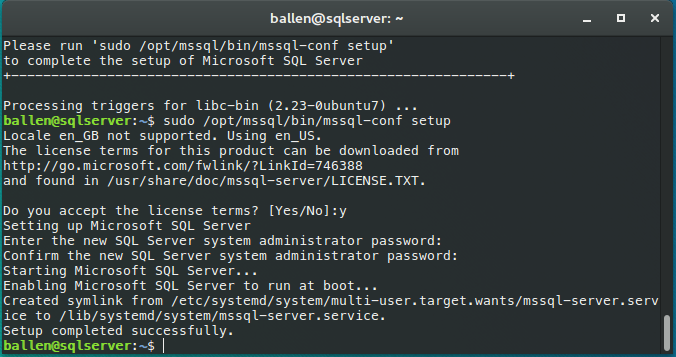 Installing Microsoft SQL Server on Ubuntu Server 16.04 – Life in apps, os's and code! I’m really liking what Microsoft have been doing recently with pushing more of their products down the open-source channels and supporting Linux and Mac operating systems. 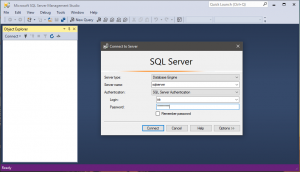 Earlier this year Microsoft released SQL Server vNEXT which can be installed and ran on Linux. In this post I will cover the process of installing and configuring Microsoft SQL Server on a Ubuntu Linux LTS (16.04) server and addition of creating a database, a user account, configuring the server firewall and automating daily backups of your databases. This tutorial requires your server to have at least 4GB of RAM (recommended as a minimum for MSSQL server vNEXT by Microsoft) and that your server is running Ubuntu 16.04. It is also recommended that you are logged into your server with a non-root user which has sudo rights granted. You will now be asked to accept the terms (if you do, type Y and the press the return key), next you’ll be asked to set a password for the system administrator password (this will be the sa account), the password will need to be a complex one, if you don’t enter a strong enough password you’ll get an error message and need to re-run the above command to try again. That’s it – Microsoft SQL Server is now running on your Ubuntu Linux server. Like we did for the MSSQL server packages, we need to add another package repository before we can install the CLI tools. We can now access and use the MSSQL CLI tools (sqlcmd – SQL CLI client and bcp – Backup CLI tool) under /opt/mssql-tools/bin/. Awesome! – That’s now installed and ready for us to use further down! If you’re not running a firewall on your server (eekk!!) you can skip this step! You may wish to further lock down the allowed incoming IP address to only allow connections from your application server and/or office IP address. Now leave the sqlcmd tool again by typing exit. 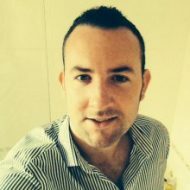 Although at this point we are able to login using the sa account it is best that we configure our applications to connect using a dedicated account, using a dedicated account reduces the ability for any leaked account details to enable that account to access and potentially destroy/access all of the databases on our server. Again, type exit and press return to leave the CLI tool. I have knocked together a shell script that you can use in order to automatically backup all user databases on your server. The script connects to your SQL server and gets a list of all databases (minus the system ones) and then proceeds to do a “full backup” of each database. Lets see if it works, type the following command – We expect it to moan at this point (as we’re not passing any commands) and not set our backup directory! mssqlbackup "/var/dbbackups" 5 "localhost" "sa" "<YourPasswordHere>"
0 20 * * * root /usr/bin/mssqlbackup "/var/dbbackups" 30 "localhost" "sa" "<YourPasswordHere>"
Save the file and exit! 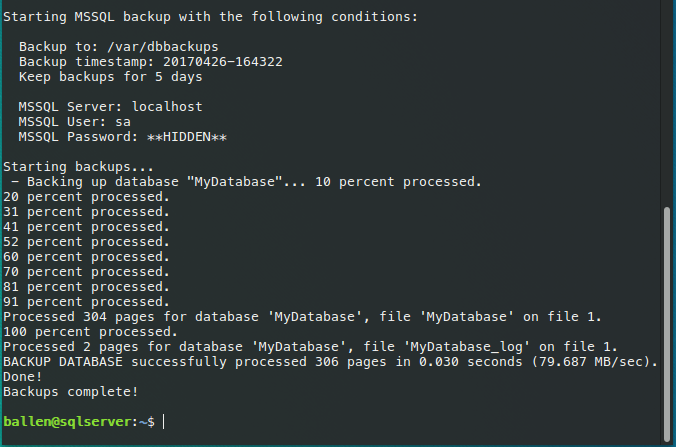 – You should now start noticing automated nightly backups of all your databases – This command is set to automatically keep 30 days worth of backups too! If you have any client machines running Microsoft Windows, you can download SSMS (Sequel Server Management Studio) from the Microsoft website, installing and using that you can connect to your new database server, manage your databases and execute queries etc. 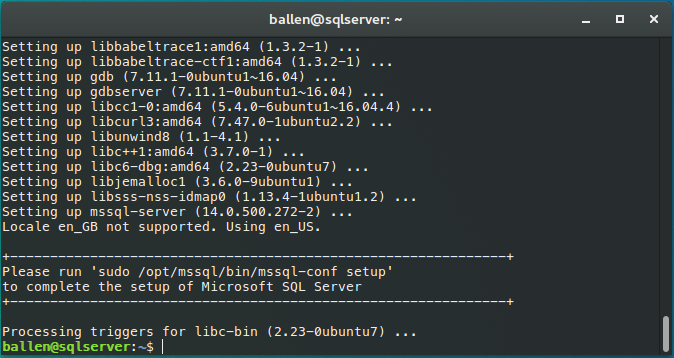 I hope you found this blog post useful and I wish you all the best with running your Microsoft SQL databases on Linux!! Pingback: Deploying and hosting ASP.NET Core applications on Ubuntu Linux | Life in apps, os's and code!